The little tag-along I discovered. ...and that's the main reason I bought him! I picked this little guy up today at a little shop out in the country, here in the Central Valley of California. 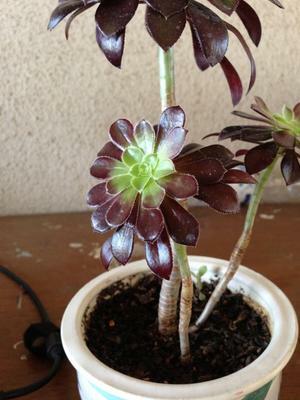 The man there grows and sells quite a few succulents, and he called this one a "Black Amber". 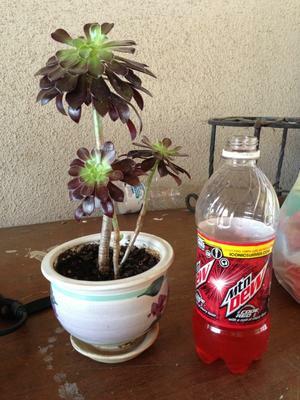 But when I got home and looked it up to figure out how to care for it, I couldn't find anything listed with that name. 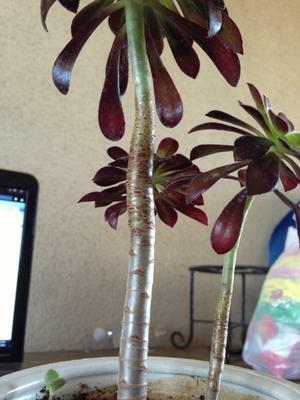 It has quite a long stem, and the man did tell me that if I want to get multiple buds growing on a stem, to cut off the head. He mentioned that the bottom (purple) leaves would fall quite often, but not to worry because it would continue to grow upward. The leaves have a 'serrated' look to their edges, and range in color from the newest being a fairly light green, to the older ones being a deep purple. 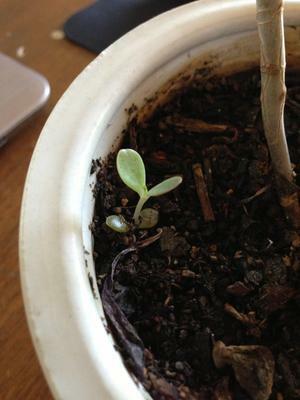 There is also another, baby succulent of some kind growing in the pot that I didn't notice until I got home. I'm unsure of what kind it is as well, though I don't know if you can identify it. Sasha, good scoop! This is an Aeonium, which are one of the most gorgeous plants when well grown. They need bright light (but prefer to not have full sun in really hot climates) and yes, you can indeed chop off it's head to make new smaller rosettes start all up the stem. I recommend this, because those bigger older rosettes will actually go to blooming, which is their last hurrah, and they die after that. Making sure you have a few younger ones to take its place is about the only major maintenance chore with these excellent plants. The little freebie is most likely one of the Kalanchoe that drops babies from the edges of the leaves all over the place, that explains why it's in the pot in the first place. You can see more about Kalanchoe delagoensis and Kalanchoe daigremontiana. Thank you for the Lorax reference!! I have been searching relentlessly for some kind of information about my truffula tree! Thank you for including the Lorax reference because otherwise I would have looked right over your post! I've been searching for ages to identify my 'Lorax' so thank u so much for these posts. I'm so happy to finally know it's name. So happy to know what my plant is :) Thank you for taking the time!